We refer to our business groups as Pioneers, which are identified in numerical order. We do not emphasize the number of groups within an area, but rather focus on quality of members. Each Pioneer Group can be compared to a Virtual Business Mall. We Believe in Local is Lekker! An East London Business Referral Network Company. We are a proud South African Business Referrals Company, based in East London, Eastern Cape. 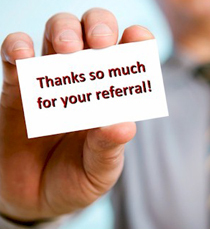 Our Core Business is Valuable Business Referrals for our members. Word of Mouth is one of the best business advertising a business can have. Personal Business Referrals also comes with Trust and Credibility. Does your business have people advertisng your business using Word of Mouth advertising? If not, you need to ask yourself why not? Contact us and attend a non-obligatory business referral get together in East London and find out for yourself how Word of Mouth Business Networking can help Grow Your Business with Valuable Referrals! We are a transparent company and keep our members - as well as members of the public - informed on proceedings within GBR4U (Pty) Ltd.
Word of Mouth is one of the most cost-effective type of advertising a business can have! This is directly linked due to the fact that People TRUST People, making Word of Mouth Advertising one of the most Powerful, yet cost effective, business Advertising that exists. Remember, People want to do business with People they Know, Like and Trust! GBR4U - Pioneer 1 Group during a Business Referral Meeting, March 2013.